Ten years ago, I used to travel all around the northeast going near and far to hockey games. One of the places that we frequented a lot was Glens Falls. Their AHL hockey team and ours had a HUGE rivalry. Friends and I would go to see the hockey games there since it was so close and a fun, intense experience. Glens Falls is a small town and the Civic Center reminds me of old style arenas before the giant monsters were built. This building was made to house a hockey team and games and it shows. 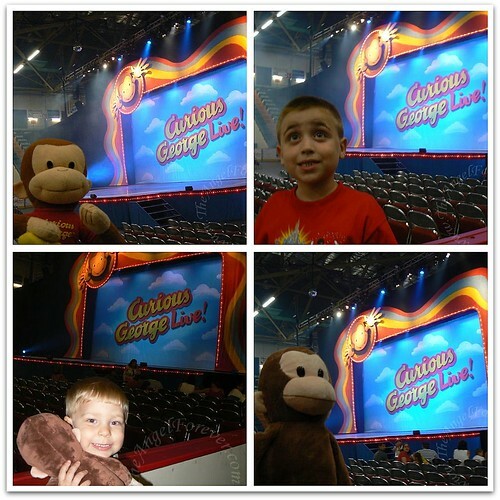 Last night, the boys and I went back to the Glens Falls Civic Center to see Curious George Live. This was not only my first trip back since getting married/having two children, it was the first time I have gone there for something aside from hockey. When we walked into the front doors, I knew it would be different. 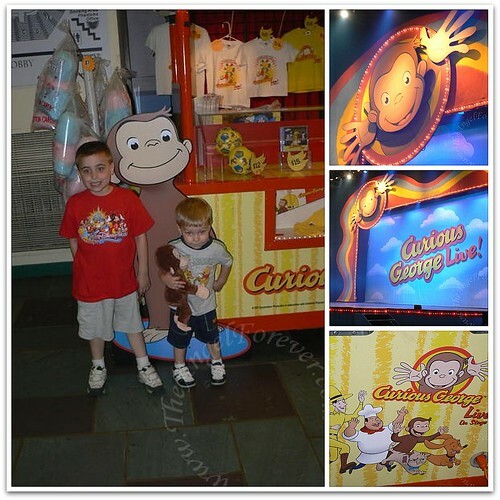 The boys were so excited to be able to go and see Curious George. JSL and I watched Curious George 2 early in the morning to get ready. 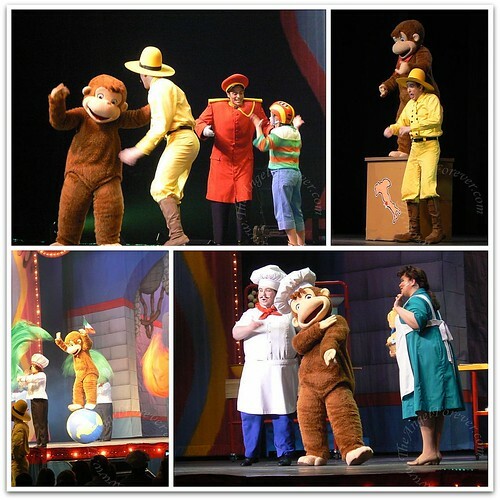 Two Curious George stuffed friends also accompanied us on our adventure to see the live show. What I had forgotten about the Civic Center is how steep the incline is and that there are NO railings to hold onto. This is no problem for most adults. TechyDad picked JSL up and carried him down the stairs to our front row seats. NHL and I walked slowly down together since neither of us wanted to accidentally knock the other off balance on the way down. When we arrived at our seats, we realized we had done well. We were not on the floor, but the area in front of us (by the hockey boards) was huge. The kids would be able to stand up and not disturb anyone throughout the show – SCORE! 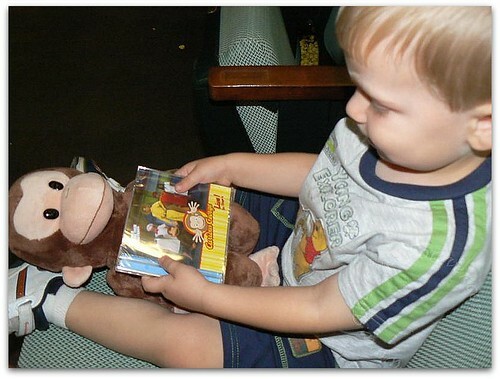 Before the show started, we looked at the Curious George merchandise. The kids did not really need a hat or shirt (which were reasonably priced for a kids show). We toyed with a program, but knew NHL and JSL would fight to look at it. We said we would watch the first half of the show and see if we liked the music and possibly get the soundtrack from the production. When the show started, both of the boys were ready. JSL stood up clutching his Curious George and did not move a muscle. He was leaned up against TechyDad’s leg and smiling away. It was funny listening to the audience react as familiar characters, like the Doorman, arrived on stage. Everyone cheered when The Man in the Yellow Hat came onto stage. I am sure they were excited to see him, but we all knew who would be coming soon afterward. Speaking of that, NHL cheered when the mischief making monkey made his way onto the stage! TechyDad and I immediately noted to each other that we really liked the catchy tunes from the show. The people that created the show did a fabulous job in several areas. They used the narrator’s voice from the PBS show. It was like we were watching a giant, in-person episode of Curious George. The dance choreography was great. Thanks to the actors and their bright costumes and props, it was nonstop fun for the entire audience. Lots of subtle jokes/one liners tossed in that would go over kids head, but were definitely appreciated by adults paying attention. When the first act was over, the boys all went up to buy the CD soundtrack. JSL was so excited about it, he would not let go of it and demanded to hold it the entire second act. The second act was a great wrap up of the adventure that George went on to Rome for the meatball contest. With a quick change of curtains, we went from the back of an airplane to the streets of Italy, and then into the meatball contest. The fun costumes really were distinct in the second half. There was a Japanese style chef – a la Iron Chef, along with an Irish inspired one. Of course, Frankie and The Meatball Girls were hilarious. Nothing like an announcer with slick backed hair and dancing plates with spaghetti and meatballs. The show ended just before 8:30. It was just under a 90 minute show and perfect length for the kids. NHL and JSL were both exhausted when we arrived into the car. Both slept for part of the ride home as they fell asleep listening to our new Curious George Live Soundtrack. 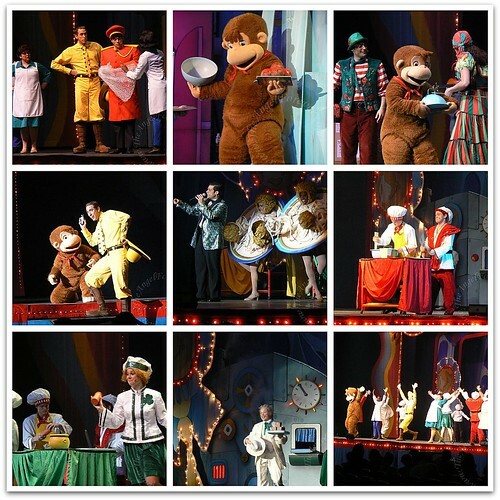 Thank you to Curious George Live for a fun filled family evening out! 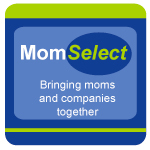 Disclaimer: Last week I read about a giveaway on Albany Mommy’s website. I entered to win 4 free tickets and found out Saturday that I had won. A huge thank you to her for meeting up with me to get the tickets. No review of this was expected, we just wanted to share the fun family night that we had. 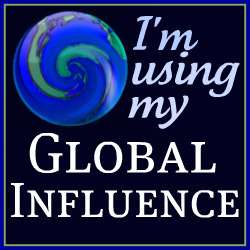 .-= killlashandra´s last blog ..Treadmill Fascination =-.